Adult Swim's December 2015 announcement that the network is reviving the noughties cult cartoon classic series, Samurai Jack, thrilled fans of the all-ages encompassing animated TV show. Revivals and remakes of nostalgic movies and TV is a popular trend in current entertainment, thus providing a perfect platform for everyone's favorite time traveling samurai's fifth season launch - due to air sometime in 2016. Details of the Toonami show's revival have been kept pretty quiet in the months since its announcement, which came with a five second teaser. However, now a new promo art image has been unveiled for the Samurai Jack revival, suggesting a gorier than usual theme for the robot and alien fighting character. Samurai Jack first aired from 2001-2004 on Cartoon Network. The show was the brainchild of Genndy Tartakovsky (Dexter's Laboratory, Hotel Transylvania) in response to his dissatisfaction with the depiction of action within animated series at the time. Tartakovsky was directly inspired by classic samurai films and Frank Miller's comic book series Ronin to create the show - one that has a very recognizable visual animation style. 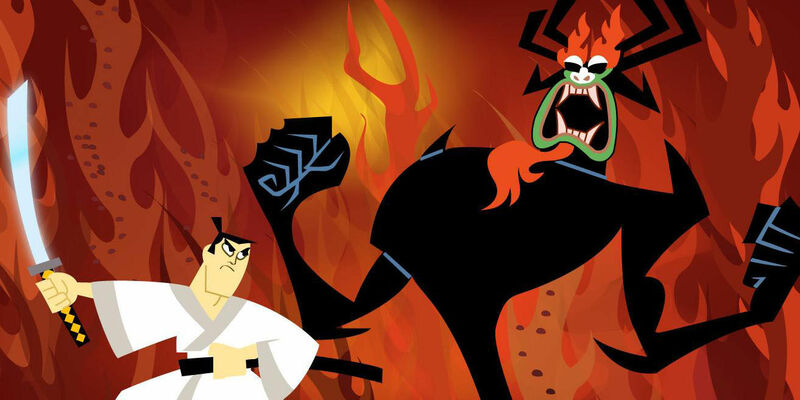 Jack (Phil Lamarr) is a samurai prince from ancient Japan who is unwillingly sent into the future during a battle with his nemesis: a shape-shifting demon named Aku (the late Mako Iwamatsu). The future is depicted as a dystopian world ruled by the demon and inhabited by robots and a range of displaced aliens that allow for Jack to showcase his fighting skills (and hilariously stoic attitude). "I would love to finish the story of Samurai Jack. I feel like people are still kind of interested in it, and it’s nice that after all these years, people are still responding to it, like two generations down almost from it being on the air for the first time....... I know the conclusion in my head now. I’ve worked it out, and so I’m trying to find what the perfect vehicle for that is." The most interesting thing about this image, in comparison to the Samurai Jack fans are familiar with, is the presence of what looks like blood. It's worth noting as Jack's opponents are usually of the non-bleeding robot/alien variety. It is unclear whether the figure is an uncharacteristically unkempt Jack and if this is the case or not, it could suggest that the show will take a darker turn thematically upon its return, perhaps expecting to appeal to the show's existing grown-up fanbase rather than garnering new younger fans. In order to please this existing audience, this revival will need to preserve enough of the original stylistic qualities and tone as the first four seasons, as many revisits of nostalgic vehicles suffer the pitfalls of too much evolution from the source and subsequent failure to capture the same magic. Despite these standard fan concerns, it will be satisfying to see this pop icon character gain resolution to his story and the choice to continue with the same TV format (rather than the Samurai Jack animated film that has been considered in the past) could be a smart move. Samurai Jack season 5 is expected to air sometime in 2016.